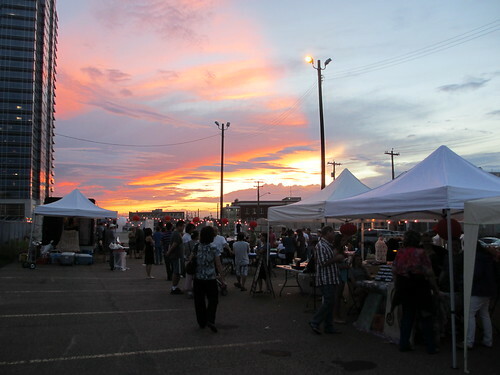 If you still need convincing to check out tonight’s 97 Street Night Market, here are five reasons! 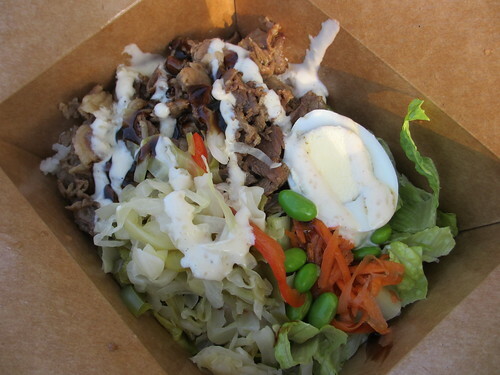 Eats, Nhon Hoa and Yellowbird Cafe. In addition, we will have a variety of desserts from Shan Shan Bakery (buns and cookies), Ying Fat Tofu (their famous dessert tofu) and Holy Cow (fresh fruit popsicles). arts and more modern sensibilities. 6:15pm – a lion dance performed by the Shang De Martial Arts will kick things off with a bang! 6:45pm – have you ever wanted to try tai chi but didn’t know where to go? The Red Dragon Tai Chi Club will not only demonstrate basic tai chi and explain its benefits, but also lead those interested in a brief lesson. 7:15pm – twelve year old Vivian Tao has mastered the guzheng (the Chinese plucked zither). Come be amazed! 7:45pm – the Sung Lee Taekwondo Demo Team will show us their equivalent ofStreet Fighter moves. Stay back – you’ve been warned! 8:15pm – Rise to Beat, or R2B, was brought together in 2012 by a love of music and dance. Their style of dancing varies mainly between hip-hop and K-Pop. They’re sure to get the energy up! 8:45pm – the Sung Lee Taekwondo Demo Team will be back for an encore performance! 9:15pm – Convergence Dance Crew is a K-Pop dance group made up of mostly non-Korean performers. Back after their popular appearance at last year’s night market, will close out the stage with a light-infused performance that will raise the bar. will be live painting a piece all evening. Come to the market for a selection of accessories, trinkets and souvenirs. Show that you love Chinatown! 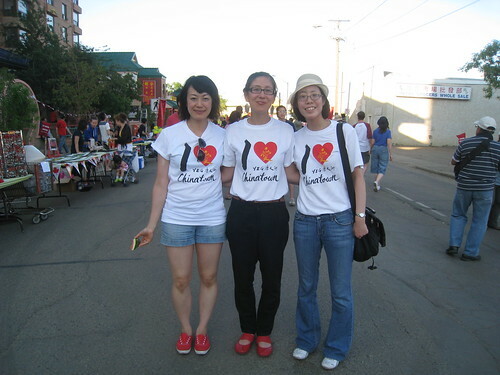 “I Heart Chinatown” t-shirts, and Sunny Snapshots will be offering free photos in their booth! showcase some of Chinatown’s culinary gems. 6:00pm, Taste of Chinatown: Ever curious about the tastes of Chinatown, but were too afraid to ask? New this year, Wild Tangerine’s Wilson Wu will be introducing you to some of the culinary treasures in Chinatown, from a fresh tofu factory to a bakery and a barbecue shop. Samples will be included along the way! Space is limited on this tour, and is first come, first served. 6:30pm, History of Chinatown: – Join Lan Chan-Marples and Peter Wong, Chinatown Heritage Tour Guides, on a walking tour of Chinatown past, present and future. Learn about Chinese settlement to Edmonton that began more than 120 years ago, the businesses and associations that sprung up to serve a growing community, and the location and relocation of Heritage Chinatown. 7:30pm, The Art of Chinatown: Join Paul Giang, Spacing Edmonton founder, and Olivia Fung on a walking tour of Chinatown that explores its artistic side and other curiosities. The tour will include work done by Dirt City Dream City, the Living Bridge, the free wall along the LRT, and the proposal of arts district in quarters. 8:30pm, History of Chinatown: – Join Lan Chan-Marples and Peter Wong, Chinatown Heritage Tour Guides, on a walking tour of Chinatown past, present and future. Learn about Chinese settlement to Edmonton that began more than 120 years ago, the businesses and associations that sprung up to serve a growing community, and the location and relocation of Heritage Chinatown. and the potential it has to capture future generations.